This spacious inflatable provides more than 200 square feet of pure bounce house fun, plenty of room for participants to jump their way through the day! Jumping is a great way to promote healthy activity for kids of all ages and will keep kids entertained for hours on end. 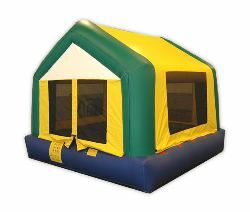 A bounce house is great for kids and teens and can be setup indoors or outdoors. A bounce house is the perfect way to combine fun and healthy activity, our moonwalks offer kids of all ages exciting aerobic activity. This jumper has 360-degree mesh windows, so parents and spectators can have a clear view of all the fun. Our bounce houses are clean, safe, licensed, insured and ready for your next birthday party, family reunion or any other event.